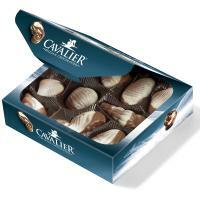 Belgian Milk Chocolate Sea Shells, sweetened with Maltitol and Lactitol instead of sugar. Cocoa solids: min. 37 percent. 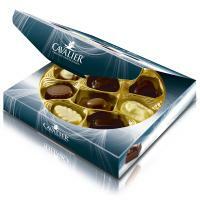 Assorted Belgian Chocolates sweetened with maltitol instead of sugar. Cocoa solids: min. 55% in dark chocolate, min. 37% in milk chocolate and min. 32% in white chocolate.